I am a creature of habit. I don’t easily tire of routines, and when I find a recipe or food I like, I will often eat it every day until the season’s agricultural tide urges change. That being said, every now and again a friend will recommend something (the breakfast bowl that inspired the image above has become one of my favorites) and it will scramble up my whole pattern in the most refreshing way. Recently, two of my best friends have been raving about steel cut oats. Their promise of a fuller, nuttier flavor and more robust consistency (as opposed to traditional rolled oats) finally wore me down; it was time for this creature of habit to break the mold. DanceFoods is the first superfood blend made specifically with dancers in mind. It contains a mix of maca root, raw cocoa, goji berries and plant protein, all sourced from small farmers growing chemical/hormone free plants. That’s all of the organic antioxidants and energizing goodness, and none of the extra junk! The blend was conceptualized by a former professional dancer who felt the stress of long rehearsal days weighing on him. With little time to prepare an adequate lunch, he could feel himself growing weaker. His solution was to create this blend, providing dancers with a quick way to digest the essential vitamins we so often miss out on. A dancer’s body is her instrument, and taking care of that instrument begins on the inside. 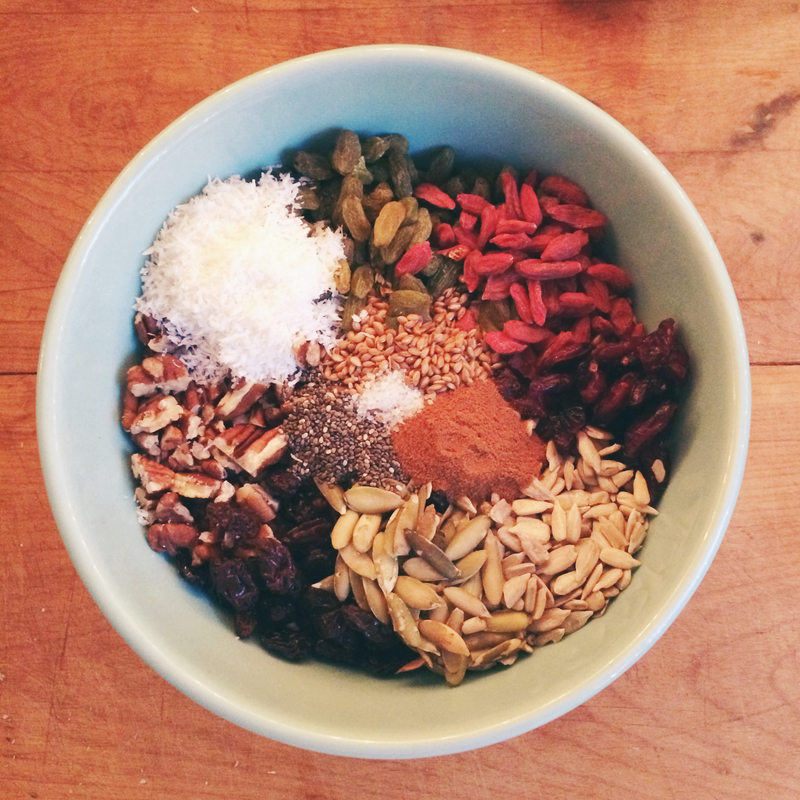 To get the best fuel possible, I’ve been cooking up some oats every morning and mixing the superfood blend right in. I top the whole shebang with some berries and cinnamon et voila! My routine has transformed. DanceFoods is offering Setting The Barre readers a 10% discount on their first purchase! Use the code ‘settingthebarre’ at checkout. Stove top granola is great in a pinch when you’ve decided your late night snack, or breakfast is desperately in need of a crunchy, sweet, nutty, hearty goodness. I make enough to last me through the week and sprinkle it over my yogurt in the morning, my smoothies, and sometimes I just eat it with my fingers straight out of the tupperware (shhhh). 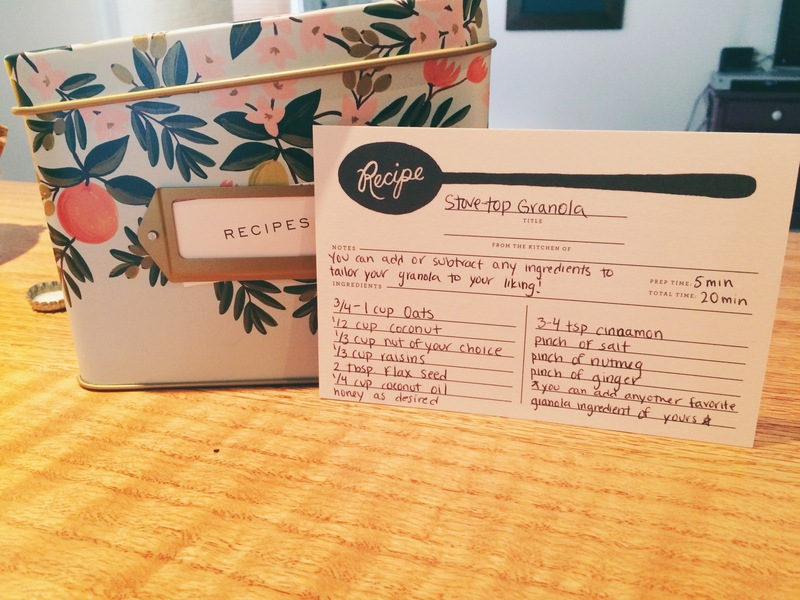 Stove top Granola: because everyone loves granola, and sometimes you don’t want to wait 40 mins as you toast up a gigantic batch in your oven. 2. As the oats start to toast up (don’t let them get too brown or toasty) add in the dried coconut. 3. Once the oats and coconut are toasting away, add in the nuts. Let these dry ingredients cook for a little bit, stirring often to avoid burning… you can always lower the heat if the cooking seems to be happening too fast. 5. Once everything is combined, add in the coconut oil and continue stirring to avoid burning!!! 7. Keep cooking for about a minute or two more. turn off the heat. 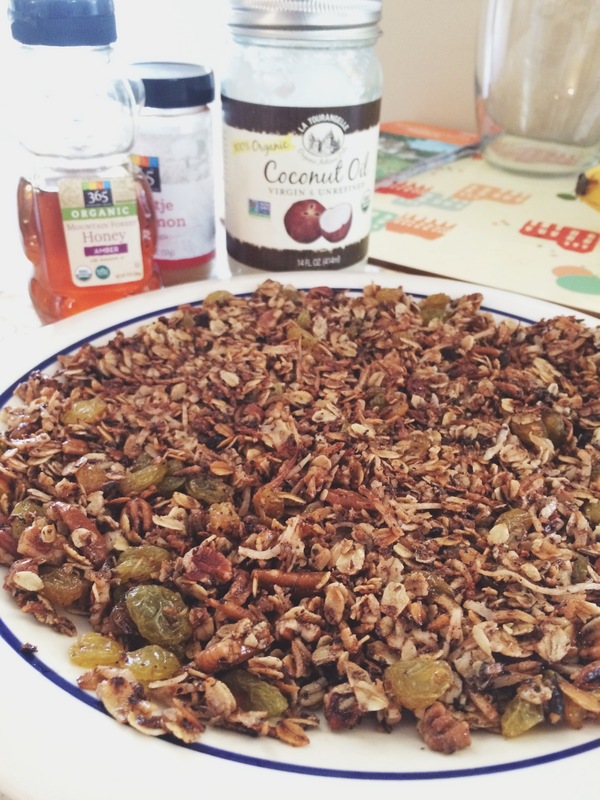 pour the granola out onto a pan or cookie sheet to let cool down and ENJOY! 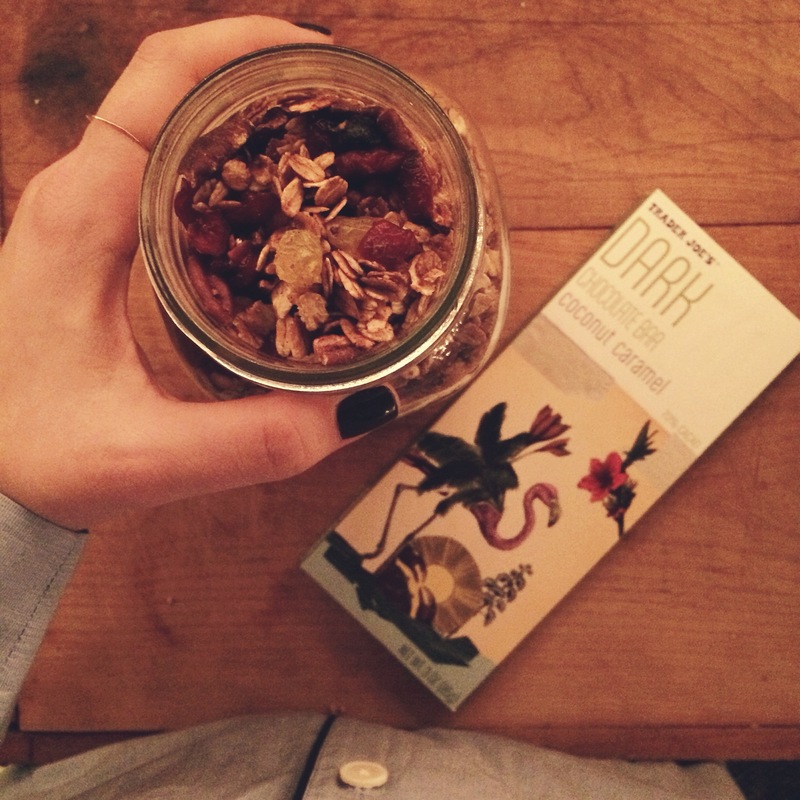 Thank you Tegan for sharing your recipe and drool-worthy photos of that crunchy granola goodness! Earlier this summer, I hopped a bus to NYC to visit a friend temporarily in town from the Royal Danish Ballet. Seven years had passed since our bonding at Jacob’s Pillow but! thanks to the joys of social media, there was a strong sense of uninterrupted connection between us. If not in a multi-paragraph message framed in Facebook Blue, than through the remarkably vivid 612×612-pixel window of good old Instagram, over the years we shared in our adventuring. We watched each other grow. Separate, but together. At long last on a rooftop above Brooklyn, pocketed by twinkle lights, we reunited. The alfresco table was beset with blondes, some faces familiar and some new. Among those whose acquaintance I’d only just made was the delightful Miss Shelby Elsbree. As the sun slipped away, we loaded up on fresh mussels, al dente pasta, and July-ripened artichokes. Basketballs abounded, flirtatious chefs offered shots and the rosé seemed to reappear endlessly. We discussed Copenhagen, Boston, Providence, Bournonville, Forsythe and Balanchine. Collectively reliving old romances, mulling over the merits of dating apps and fantasizing future travels we filled the gaps between our cities with easy communication and the breaking of bread. 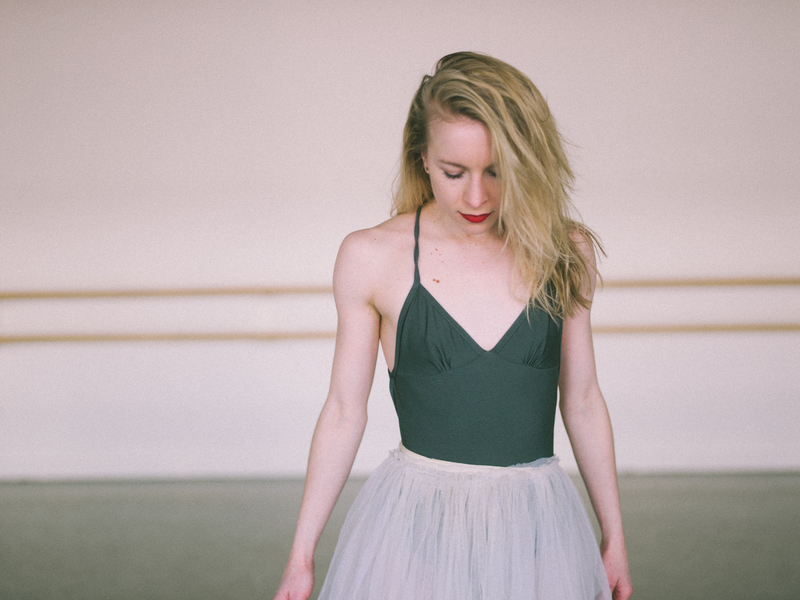 The notoriously small nature of the ballet world felt tangible on that breezy New York evening and again this past weekend, when Jessica Spinner of The Whole Dancer reached out to me about her webinar on eating and injury prevention for dancers. The internet seminar, live on August 27th at 8 pm (or whenever it hits your inbox- all who register will receive a copy of the discussion via email) is completely free and features none other than, that’s right, Boston Ballet Corps Member, Shelby Elsbree. Balancing strength and artistry seems a fitting topic for Miss Elsbree, a spirited pint of a person whose energy supersedes her. 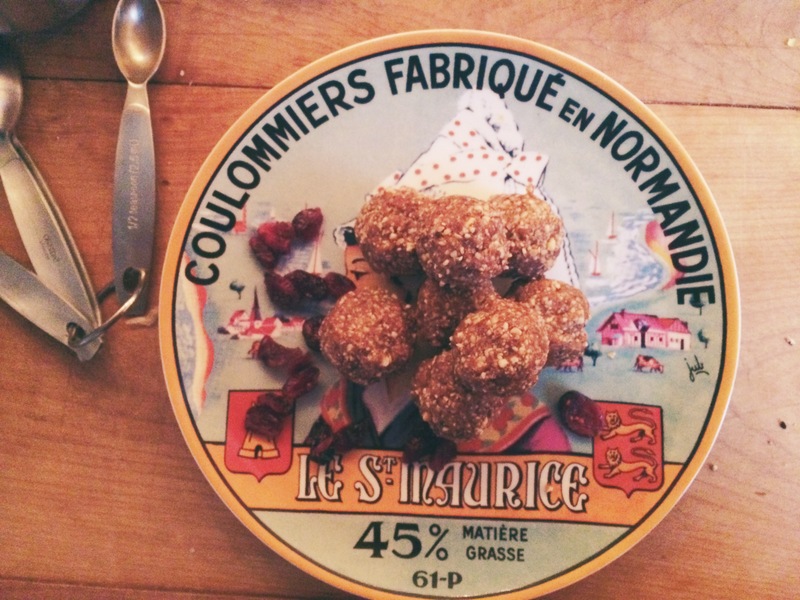 The collection of “culinary curiosities” and bits of ballerina life comprising her blog, Tutus & Tea, showcases her unique ability to maintain a harmony between the two. Here, in her lovely little corner of the web, Shelby proves she has as much grace and power in the kitchen as she does in the studio. Avoiding injury as a professional dancer is hard. Cultivating a healthy relationship with food can be, too. That essential, deeply personal balance between dance and life often alludes us. 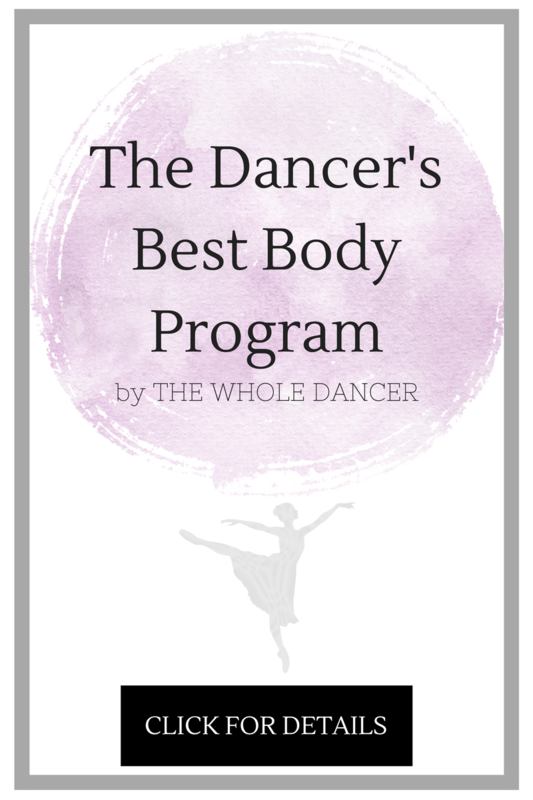 To steal Shelby’s secrets, register for the free webinar (live one week from tonight), and join as she and holistic health coach, Jessica Spinner, navigate the twisting road towards a protective and empowering dancer diet. Learn how to decipher primary and secondary foods, choose superfoods when recovering from an injury, and experiment with an eating plan to reach your ideal dancer’s body. Nourish your body and mind. Your tastebuds (and injury-free bod!) will thank you. photos by Kenneth B. Edwards. January is a rough month. It’s long. It’s cold. It’s still fairly dark when your alarm goes off in the morning, and it seems like April is mocking you with its Eastery glow…3 hard months away. First combine 2 cups of nuts (I used 1 cup almonds, 1 cup pecans) in a food processor until coarse. 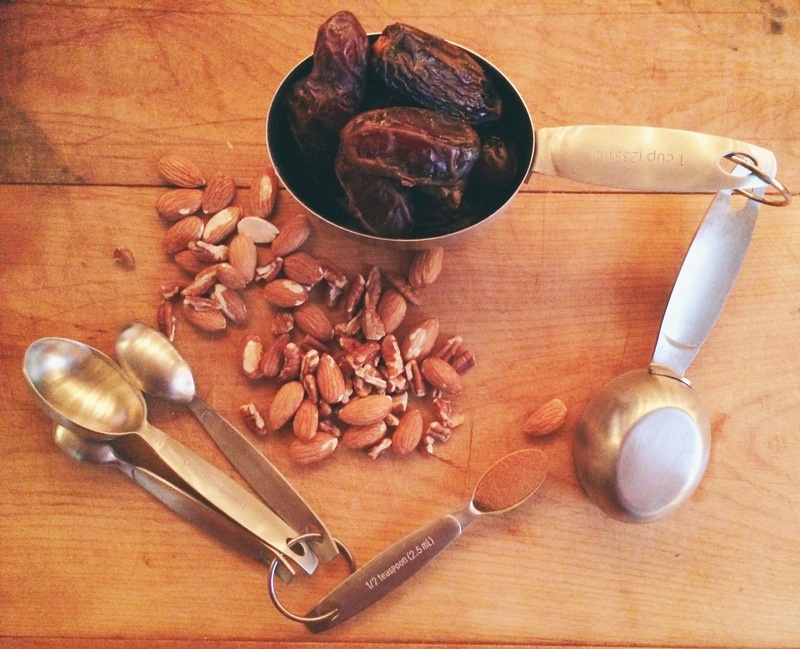 Then add in one cup of dates (I used medjool), and 1/2 teaspoon of cinnamon and process again for about 2-3 minutes. Then shape into balls and roll in shredded coconut for a shmancy touch. 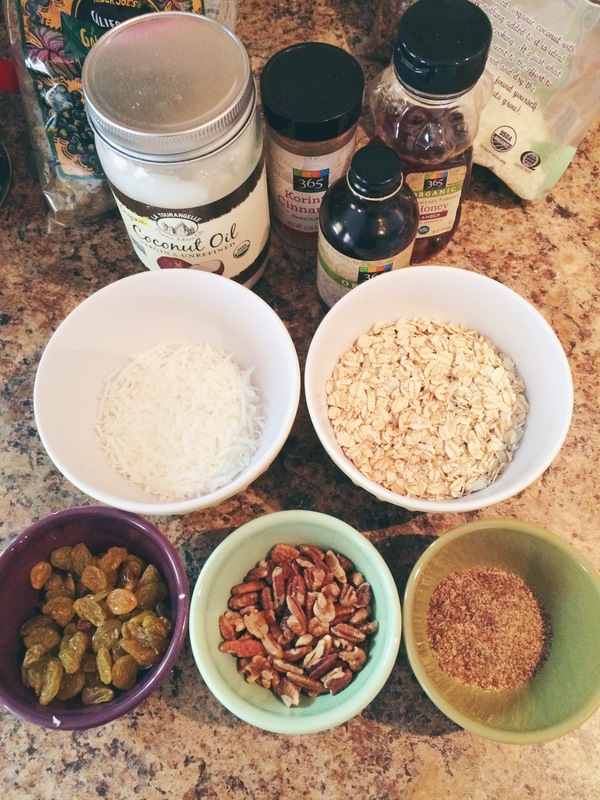 Outside the regular treats rotation, I’ve been attempting to cure my cold weather slump by making myself some special snacks, including a homemade granola using Alex’s family recipe, and a delicious muesli, the recipe for which I created as I went along. Dedicating my Monday nights to the kitchen and surprising my friends with yummy bites has really helped lift my spirits as of late. I’d love to know, how do you boot the winter blues? Would you ever consider a “treats rotation” with your friends? I recently discovered a new health food blog through an old ballet friend on trusty ol’ Instagram. Naturally Sassy is written by a British ballerina who decided to go vegan a few years back in a (successful) attempt to cure her chronic eczema. Since making the switch to a diet of everything diary, gluten, meat and sugar free, Saskia has discovered the many benefits of this new lifestyle. Inflammatory and acidic properties found in these food groups can have short and long terms effects on your health, including weight gain, acne/dry skin, high cholesterol, lowering of the immune system and digestion and stomach problems. Yuck! Reading the short bit of information on the vegan lifestyle presented on Saksia’s blog, I decided to give up meat, most of the dairy I currently consume, complex sugars, gluten, and all processed foods. And what better way to kickstart this new lifestyle than by whipping up a batch of Naturally Sassy’s homemade almond butter?! With just 3 ingredients and a food processor, you too can make your very own delicious, protein-packed almond butter. I added mine into a smoothie with banana, medjool dates, flaxseed and almond milk and oh.my.god, you guys, it was so scrumptious. That’s what has me hooked on this blog; Her recipes are so healthy, but also combine a range of flavors that I can totally get on board with. Roasted sweet potatoes and avocados galore? Yes, please! So, granted I have enough time to actually cook and blog about it this season, expect to see a lot more of my kitchen experiments here on STB! Other recipes I’m dying to try include the perfect kale salad, sweet potato salad with avocado mayonnaise, and the blueberry and baobab pancakes. It seems that every year as June rolls around, beach season begins and my desire for a sculpted bikini body directly conflicts with the inevitable decrease in my daily physical activity. The past two summers in particular (last year I was recovering from an injury, the year before I had surgery on my toe) have been especially slow on the whole work out front, which is perhaps the reason for this year’s boosted motivation. I’ve been finding some way to sweat every morning (a rotation of ballet class and kickboxing with a few dedicated buds), but sticking to a diet in the summer is about as easy as going to Target for one item and not coming home with a carload of things you never knew you needed (does that happen to anyone else?). Just when you’re doing really well and eating right, it’s someone’s birthday and one too many drinks must be had. Then your friend invites you to your favorite pub on a Wednesday night and how do you not order those garlic fries that just walked by only to stop at the table right behind you? However, recently I’ve set a goal for myself; Maintain healthy eating during the week, and use weekends as little cheat treat days! Breakfast can be a tough meal to stick to. Some people just skip it altogether (BIG mistake! Most important meal of the day to kickstart your metabolism! ), but I’m one of those freaks who wakes up with a growling tummy, always ravenous for anything with a side of bacon. Of course, since that’s not exactly time, budget or diet friendly, I decided to whip up a batch of healthy banana-oat muffins to grab and go for breakfast, snack time, or anytime, really. These guys are packed with tons of good nutrients and don’t use much sugar, so you can start your day out on the right bite. 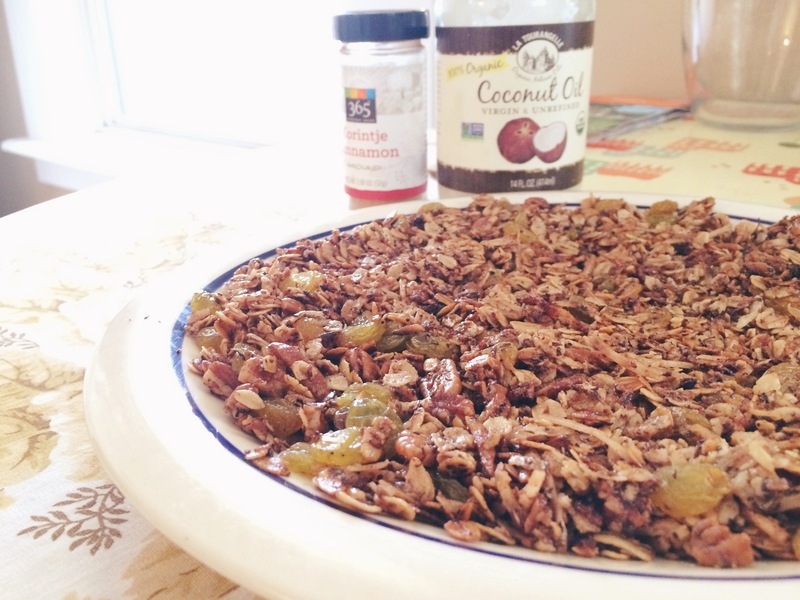 I used this recipe, but substituted coconut oil for applsauce (just use 1/2 the amount of oil) and added raisins and ground flax seed for added fiber, but next time I’m throwing in some coconut flakes, cinnamon and chopped walnuts, too! Yum! For the second annual company “Pumpkin Party” this weekend, T and I made some exceptionally delicious hummus. But not just any old hummus. 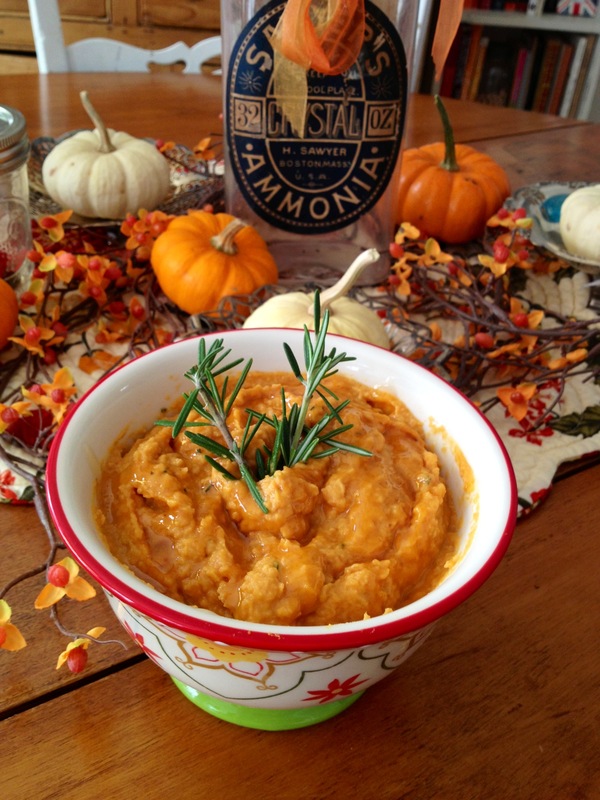 Roasted garlic, rosemary, pumpkin hummus. Yes, yes, yes. It was as amazing as it sounds, we will be making it again by the end of the week, and you can have the recipe. You’re welcome.